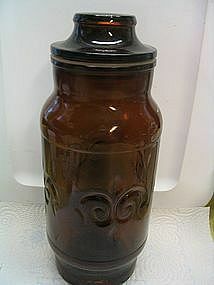 1 quart canister/apothecary jar. There is no manufacturer's mark, could be Owens Illinois. For some reason, I keep thinking it was sold containing something like Tang or coffee. I may very well be mistaken on that fact. It has a lovely incised fleur de lis design repeated 4 times on the body and a small version on the lid. No chips, cracks, breaks or damage to the glass, however, the plastic seal on the lid is showing age, but is still functional with no cracks. 2 are available. I need your zip code to calculate the postage.